Ahhhh, the holidays. So much food, so much drinking, and a lot of holiday cheer! Sometimes I get stumped on what to take to a holiday party. I don’t want to bring the same thing every year (although I do make a mean holiday veggie/cheese tray), but I also don’t want to make something that will take forever or is a huge hassle. I don’t know about you, but when there is a party I tend to gravitate towards the punch bowl (even if it isn’t spiked). There’s something about the flavor and texture of a sorbet melting in its own juices and other flavors that screams deliciousness. So I decided to make this drink, which is basically like having your own personal mini-punch bowl. A dream come true for me and even more amazing than I could have imagined! The cranberry sorbet is one of the most flavorful sorbets I’ve ever tasted. Super sweet with a little bit of that tangy cranberry bite. Mixing the sorbet with the rosé just tastes so right. They compliment each other well, creating a mimosa that goes down real smooth. Almost dangerously so. ? 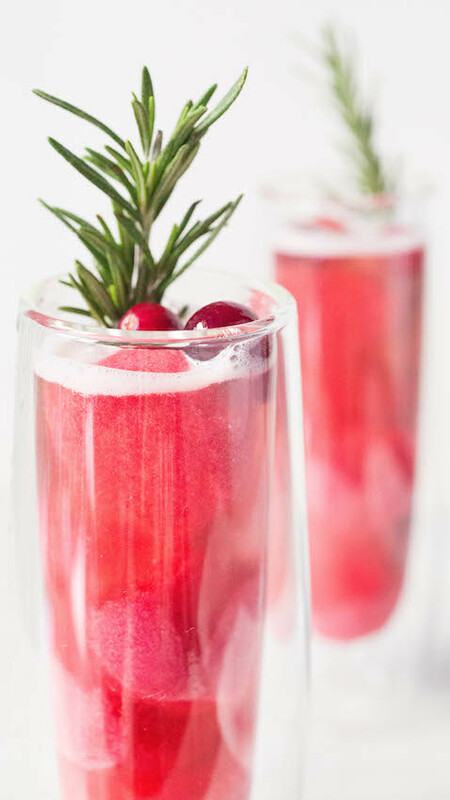 I’ll definitely be starting off my Christmas morning with a glass (or two) of this drink and can’t wait until the next party to share in the drinking and spreading of cheer!!! Bring cranberries, sugar, water, white cran-strawberry juice, and salt to a boil over high heat. Once boiling, reduce to a simmer and cover. Let simmer for 15min. Cool mixture for 10 min and then puree in a blender until smooth. Press mixture through a fine mesh strainer to remove any seeds and pulp. Stir in corn syrup and zest. Cover and refrigerate until completely chilled. Once chilled, run through a fine mesh strainer one more time to get rid of any residue that has collected on top of the mixture. Pour into your ice cream maker and process according to the manufacturer’s instructions. I let mine churn for 20min. You can serve immediately or store in an airtight container, overnight, in your freezer, to make the sorbet a bit more firm. Using a cookie scoop, place 4-6 balls of sorbet into a champagne glass. Place one sprig of Rosemary into each glass. 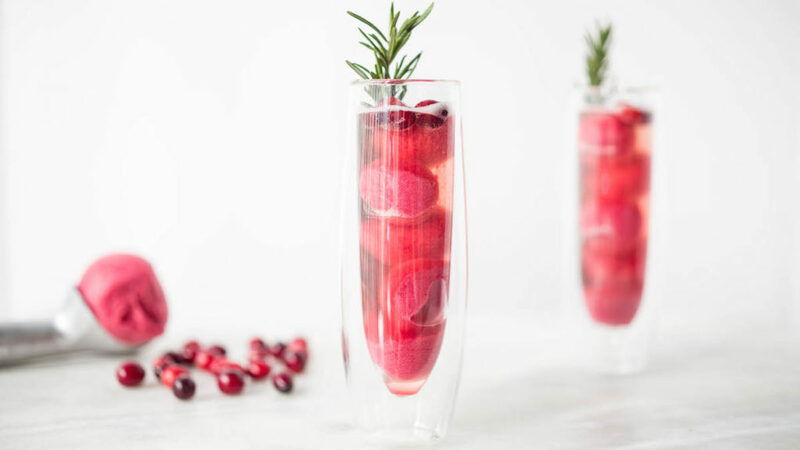 Add a few cranberries for garnish. Let drink sit for a few moments so the sorbet melts and mixes with the rosé. 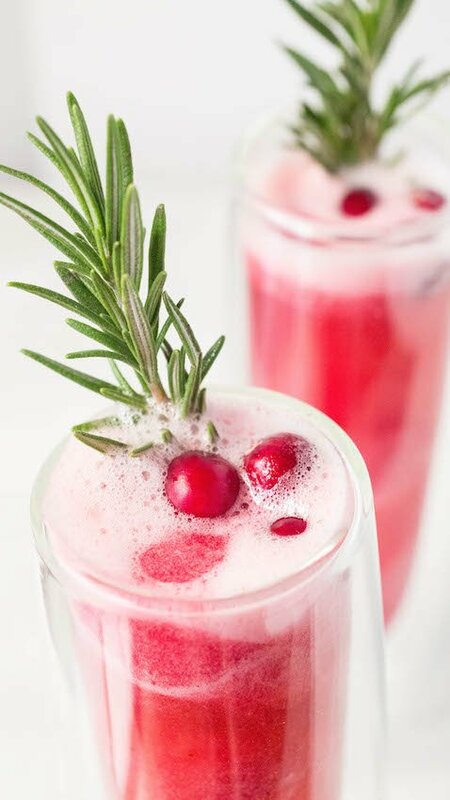 What a delicious and festive holiday drink! Pinned for later!